Background: FHIT (Fragile histidine triad) a member of tumor suppressor family, has been extensively studied in many solid tumors including head and neck squamous cell carcinoma. Among all head and neck cyst and tumors odontogenic lesions account approximately 3%-9%. The molecular pathogenesis of these lesions is less explored. Defects in cell cycle regulators and tumor suppressor genes could result in the development of odontogenic cyst and tumors. Hence, we aimed to determine the significant role of a tumor suppressor gene FHIT in most commonly occurring odontogenic lesions mainly ameloblastoma, odontogenic keratocyst and dentigerous cyst. Subjects and Methods: Immunohistochemical analysis of FHIT was done in ameloblastoma, odontogenic keratocyst, dentigerous cyst and dental follicle. Interpretation of the stained slides were done using standard scoring criteria by two pathologist. The results were subjected for statistical analysis. 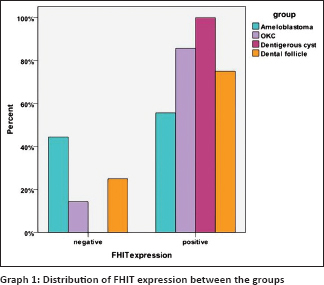 Results: Expression of FHIT varied among the groups, with highest negative expression in ameloblastoma 44.4% followed by odontogenic keratocyst 14% and 100%positive expression was seen in dentigerous cyst. The expression levels between the groups were statistically insignificant. Conclusion: The varied expression or negative expression of FHIT could be considered as an indicator for aggressive behavior and transformation of preneoplastic/cystic epithelium. Odontogenic cysts and tumors arise from cell rests of dental lamina or root sheath/structures associated with tooth apparatus. Odontogenic lesions arising from odontogenic tissue comprises diverse set of lesions. This diversity reflects the complex development of the tooth apparatus, as these set of lesions arise from any of the changes occurring during the normal odontogenesis. It is important to understand the biological behavior of the Odontogenic lesions to achieve a better treatment strategies and prognosis. It is well-known that the cell cycle is controlled by many regulators and genes such as oncogenes, proto-oncogenes, cyclin dependent kinases, cyclin dependent kinase inhibitors and tumor suppressor genes. Presently these regulators of cell cycle have gained the attention of researchers to know the exact role in the Odontogenic lesions. Recently FHIT and its products have been studied by many researchers in regards to its role in tumor formation and progression. According to the literature its role in various human cancers (bronchial, esophageal, colorectal, breast, and cervical cancers),,,, have been studied, but in Odontogenic lesions is sparse and only one study has been documented. Hence, our aim was to determine whether the loss of expression of FHIT occurs specifically to the aggressiveness of the Odontogenic lesions mainly in dentigerous cyst, Odontogenic keratocyst, ameloblastoma. Study sample consisted of 40 diagnosed cases of Odontogenic lesions which were sub grouped into ameloblastoma, Odontogenic keratocyst, and dentigerous cyst 10 each with 10 cases of dental follicle. The above mentioned samples were confirmed histopathologically under routine stains and Formalin Fixed Paraffin Embedded (FFPE) tissue blocks were retrieved from the departmental archives of Oral Pathology CIDS-Virajpet [Figure 1]. The cases not satisfying the histopathological criteria outlined by the World Health Organization were excluded along with the cases showing intense inflammation, OKC associated with Nevoid Basal cell syndrome. The study was approved by an Institutional ethical committee of institute CIDS (Ref No: CIDS/ADM/4318/2012). The selected cases were subjected to immunohistochemical staining with FHIT antibody using standard protocol of immunohistochemistry. The expression of FHIT was determined immunohistochemically by using monoclonal antibody. (ABCAM life sciences.) With Biogenex polymer HRP detection system. The sections were mounted on charged slides (commercially available Biogenex Life Sciences Pvt. Ltd) were incubated at 58°C overnight. The sections were subjected for the standard immunohistochemical staining procedure according to the data sheet provided with kit. Antigen retrieval was performed by use of the microwave method under citrate buffer (pH-6.0) for 20 minutes. The slides which were treated with antigen retrieval solution were allowed to cool to room temperature. The slides were rinsed in distilled water for 5 min and transferred into TBS buffer (pH-7.5) for 10 minutes. Post power block the sections were treated with primary antibody FHIT for one and half hour. This was followed by 2 changes of TBS buffer wash for 5 minutes each to remove unbound antibodies. Super enhancer was used for duration of 30 minutes to enhance the reaction between primary and secondary antibodies.TBS buffer was ensured for removal of any unbound antibodies. The sections were stained by the modified labeled avidin – biotin technique with Biogenex polymer HRP for 30 minutes to elongate chain and label the enzyme. This was followed with a TBS buffer wash. Chromogen and DAB buffer were added to stain the tissue antigen for around 8-10 minutes than the reaction was arrested by distilled water and counter stained with Harris's Hematoxylin, dried and mounted using DPX. During each batch suitable positive (breast carcinoma) and negative control (without primary antibody) were used. Oral squamous cell carcinoma and breast carcinoma were used as a positive control. The epithelial cells expressing brown color in the cytoplasm were considered as immunohistochemically positive for FHIT [Figure 1]. Interpretation of the slides were done by two pathologists by selecting 10 random high power fields. The interpretation of the immunostaining was classified as either positive (>10% cells stained brown) or negative (<10% of cells stained brown) as mentioned in previous studies done by Lee JI, et al. 2001. The percentage of cells expressing the FHIT immunostain were calculated by using the below mentioned formula. Also the intensity of the staining was considered as low, moderate and strong. The results were subjected for statistical test using SPSS Statistics software 21.0. 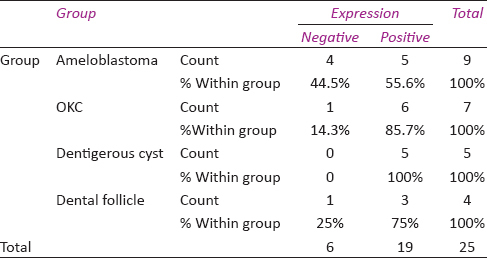 According to our scoring criteria the negative expression or complete absence of FHIT expression was observed in ameloblastoma cases 44.4% (4 out of 9) mainly in the peripheral cells of follicles than the central part, the staining intensity was almost low to moderate in these cases. Following this Odontogenic keratocyst (OKC) 14% of cases showed negative expression (1 out of 6) and the staining intensity was moderate throughout the epithelial lining, all the cases of dentigerous cyst showed positive expression 100% (5 out of 5) with moderate to strong staining intensity and among 4 cases of dental follicle one case showed negative expression and three showed strong positive expression. There was no statistical differences between the groups by Chi-square test with P value =0.261. The distribution of expression levels of FHIT has been shown in [Graph 1] and [Table 1]. It is well documented in the literature that FHIT is an important tumor suppressor gene, which was isolated and identified by collaborating researchers in the USA and Japan in 1996 and it showed to extent the most common human fragile chromosomal site FRA 3B at 3p14.2.,, The role of FHIT has also been studied in head and neck cancer, along with this, reduced or absent expression of FHIT has been reported in primary cancers, in cancer cell lines, and in precancerous lesions. Along with deletion mechanism of FHIT, there are other modes like DNA methylation and histone modification which can be together termed as epigenetic changes support the concept of FHIT as a tumor suppressor. Absence or reduced expression of FHIT can indicate the aggressiveness of the lesion or transformation into higher grade of the neoplasia and pre-neoplasia., Recent studies on immunohistochemical assessment of FHIT expression in head and neck squamous cell carcinoma have shown substantial reduction in the expression suggesting the poorer prognosis in cases of poorly differentiated cases., On literature search the role of FHIT gene has not be explored in odontogenic lesions in Indian scenario. Hence, we attempted to study its role in odontogenic lesions. The present results are in accordance with study done by Malcic A et al., in 2008, where they found that the negative reaction was more in odontogenic keratocyst than the radicular and dentigerous cyst (74%, 49% and 31%) respectively. In our study ameloblastoma showed higher negative expression suggesting its local aggressive behavior. Thus, it can be differentiated from cystic lesion and dental follicle. On the other hand among 5 cases of dental follicle one case has shown negative expression, suggesting it might undergo either cystic or neoplastic changes. Therefore it is important to clinically evaluate further to observe the changes occurring in same case. Inference of our study proposes that there is strong differences in FHIT negative expression between the ameloblastoma, OKC, dentigerous cyst and dental follicle. Whereas DC has positive expression than that of OKC and ameloblastoma supporting its cystic behavior. It was stated in the study of Tanimoto et al. that unusual expression of FHIT could be seen in pre-neoplastic/non-neoplastic epithelium. Few of the leukoplakic cases in his study showed negative expression and one of the leukoplakic case has undergone malignant transformation within three years of duration. Thus, it suggests that the aberrant expression of FHIT in the pre-neoplastic and normal epithelium could undergo malignant transformation in future. Hence, it is important to follow up the patients diagnosed for odontogenic lesions to know the transformation and reoccurrence. Due to the lack of clinical data of the cases considered in our study and we couldn't stain the entire samples (1-ameloblastoma, 3- OKC,5-DC and 6-DF) mentioned in the study as the FHIT antibody material was lost during the process of standardization, because of which we couldn't draw a proper conclusion. To conclude the varied expression of FHIT in our study cases may add knowledge to the existing literature on FHIT as a tumor suppressor gene and its role in odontogenic lesions Therefore, it is important to understand the biological behavior of odontogenic lesions and lining epithelia at the earliest to achieve better treatment plan, prognosis and low recurrence rate. Future studies with more sample, clinical data and advanced techniques are necessary to understand the exact mechanism of FHIT. Nanci A. Ten Cate's Textbook of Oral Histology and Embryology. 7th ed. St. Louis: Mosby Elsevier Publishers; 2008. Shear M. Cysts of the Oral Regions. 4th ed. Blackwell: Munksgaard Publishers; 2007. Ruddon RW. Cancer Biology. 4th ed. England: Oxford University Press; 2000. Malcić A, Jukić S, Anić I, Pavelić B, Kapitanović S, Kruslin B, et al. Alterations of FHIT and P53 genes in keratocystic odontogenic tumor, dentigerous and radicular cyst. J Oral Pathol Med 2008;37:294-301. Matthews CP, Shera K, Kiviat N, McDougall JK. Expression of truncated FHIT transcripts in cervical cancers and in normal human cells. Oncogene 2001;20:4665-75. Zhao P, Liu W, Lu YL. Clinicopathological significance of FHIT protein expression in gastric adenocarcinoma patients. World J Gastroenterol 2005;11:5735-8. Ingvarsson S, Agnarsson BA, Sigbjornsdottir BI, Kononen J, Kallioniemi OP, Barkardottir RB, et al. Reduced fhit expression in sporadic and BRCA2-linked breast carcinomas. Cancer Res 1999;59:2682-9. Lee JI, Soria JC, Hassan K, Liu D, Tang X, El-Naggar A, et al. Loss of fhit expression is a predictor of poor outcome in tongue cancer. Cancer Res 2001;61:837-41. Reichart PA, Philipsen HP. Odontogenic Tumors and Allied Lesions. London: Quintessence Publishing Co. Ltd.; 2004. Mosqueda-Taylor A. New findings and controversies in odontogenic tumors. Med Oral Patol Oral Cir Bucal 2008;13:E555-8. Gaitán-Cepeda LA, Quezada-Rivera D, Tenorio-Rocha F, Leyva-Huerta ER. Reclassification of odontogenic keratocyst as tumour. Impact on the odontogenic tumours prevalence. Oral Dis 2010;16:185-7. Mendes RA, Carvalho JF, van der Waal I. Biological pathways involved in the aggressive behavior of the keratocystic odontogenic tumor and possible implications for molecular oriented treatment – An overview. Oral Oncol 2010;46:19-24. Kujan O, Oliver R, Roz L, Sozzi G, Ribeiro N, Woodwards R, et al. Fragile histidine triad expression in oral squamous cell carcinoma and precursor lesions. Clin Cancer Res 2006;12:6723-9. Kitamura K, Hayashi K, Kobayashi R, Ishii H, Matsubayashi J, Matsumoto T, et al. Clinicopathological significance of the fragile histidine triad transcription protein expression in laryngeal carcinogenesis. Oncol Rep 2008;19:847-52. Druck T, Hadaczek P, Fu TB, Ohta M, Siprashvili Z, Baffa R, et al. Structure and expression of the human FHIT gene in normal and tumor cells. Cancer Res 1997;57:504-12. Tanimoto K, Hayashi S, Tsuchiya E, Tokuchi Y, Kobayashi Y, Yoshiga K, et al. Abnormalities of the FHIT gene in human oral carcinogenesis. Br J Cancer 2000;82:838-43.